Less than six months after its launch alongside iOS 7 last September, Apple's iTunes Radio has become the third most popular music streaming service in the United States, according to a new report from Edison Research and Statista (via Fortune). While Pandora and iHeartRadio took first and second place with a 31% and 9% share of the market respectively, iTunes Radio accounted for an 8% share with over 20 million users, passing Spotify's 6%. Apple's streaming service also passed the likes of competitors such as Google Play All Access, Rhapsody, Slacker, and TuneIn Radio. 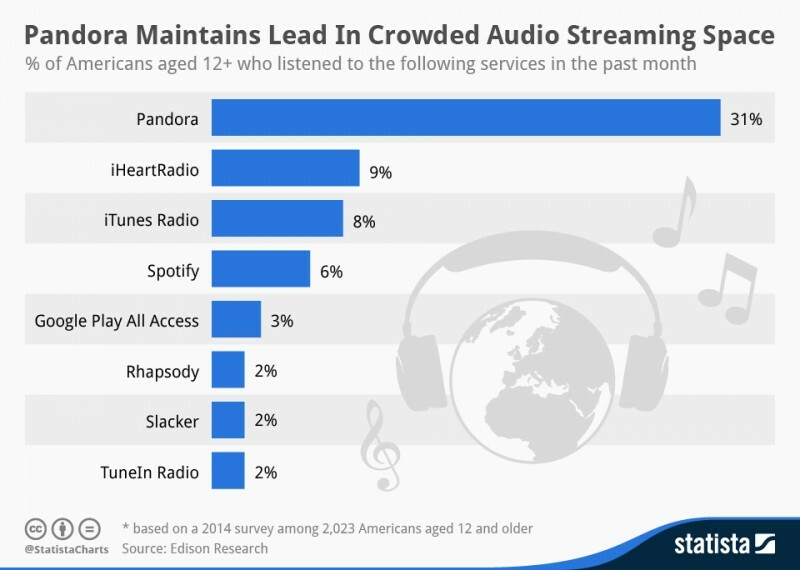 While users can hop between services freely (and at least one report has suggested that 92 percent of iTunes Radio listeners also find time for Pandora), that figure would suggest that iTunes Radio is growing at the fastest rate of the top three services, and is likely to overtake iHeartRadio in the next quarter or two. Apple launched iTunes Radio in Australia last month, as the company looks to ultimately have the service "in more than 100 countries," according to senior vice president of Internet software and services Eddy Cue. The company will be able to roll out its service to additional countries more quickly than competitors due to its existing international rights deals with Universal Music Group and other record companies. 1. Takes too much effort to build a specially catered playlist. Pandora's algorithms are second to none in mine and many people's experience. And they've developed a reputation around this. I rarely felt the need to skip. 2. Spotify is incredibly expensive. Even for people who pay the 'Apple Tax'. And have the ability and time to dedicate to building their own playlists... In order to build a playlist from songs and store for offline usage on your mobile, Spotify wants $120/yr... and you lose it all if you ever stop paying. iTunes Match with ad free iTunes Radio is $25/yr and leaves you a leftover $95 budget for 73-95 new DRM free songs licensed to you, perpetually and not tied to a subscription service. That's 2, maybe 3 whole completely new playlists. In reality, can spend a fraction of that to merely bolster, rework and refresh current playlists. You need to read up on statistics. I know, it seems at first to make no sense at all, I thought the same way originally - but if you read up on statistics you'll understand that getting the correct sample size for the correct results is often less than 1% of the group you are studying. Where's the love for the netherlands? As early founders of at least parts of the U.S, we expected and hoped for a bit more love from you people. Years and years go by, and the hope for a dutch speaking Siri, or the release of iRadio, are painfully absent. To be fair though, Pandora and Itunes Radio don't really offer what Spotify does. Spotify is the biggest streaming service in terms of letting you listen to exactly what you want. It's not an internet radio unlike the previously mentioned services. Spotify should be compared to Google Play All Access and Rdio. I've never used Itunes Radio, seeing as it's not available in where I live. Nevertheless, correct me if I'm wrong but you can't listen to a specific song whenever you want, right? How is $120/yr expensive for listening to exactly what you want whenever and wherever you want? I honestly don't get the point of iTunes Radio. How is it different to Pandora and what does it do that other simplistic internet radios don't already offer? Yeah the US, now make it available in other countries please. I have been a subscriber to both Pandora and Spotiify for years and I put them way ahead of iTunes Radio. There is no diversity on iTunes Radio and it consistently plays the same tracks over and over. I picked one particular "featured station" once and it literally played Song A followed by Song B and back to Song A and then back to Song B. Are you serious? If it's one thing that annoys me, it's when streaming music repeats tracks. It just doesn't seem like iTunes has the library some other services have.